Ford claims that their new EcoSport compact sports utility vehicle (SUV ) will deliver enhanced versatility and capability, more refined styling and sophisticated technologies for customers in Europe. The new EcoSport will arrive in Ireland in late January. When it goes on sale here, it will be offered in Titanium and ST-Line versions with a segment leading range of high technology and luxury extras as standard including: Ford SYNC 3 Navigation with 8” touchscreen; DAB radio; Emergency Assistance; Apple CarPlay/ Android Auto; Rear View Camera; Keyless Start; Cruise Control with Speed Limiter; and Partial Leather Trim. With a lead-in price of €26,900 (Titanium 1.0 litre 125PS EcoBoost petrol ), full specification and price detail will be issued when new EcoSport arrives in Ireland. 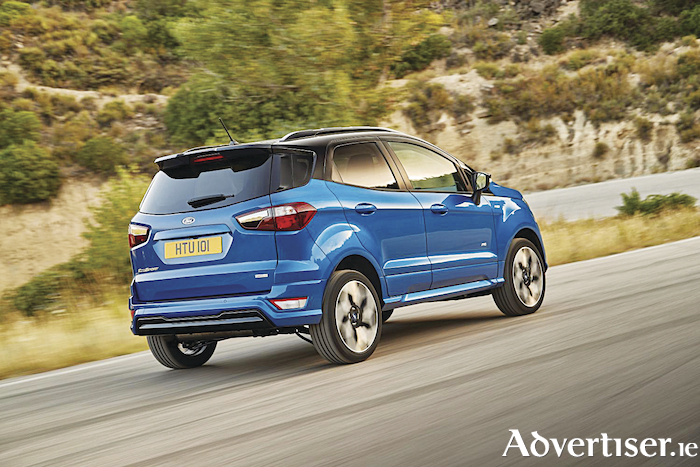 The new Ford EcoSport for the first time offers Ford Intelligent All Wheel Drive technology for improved traction on- and off-road, combined with an advanced new 1.5-litre EcoBlue diesel engine, delivering up to 125PS. It will be offered from launch with a six-speed automatic gearbox featuring steering-column mounted paddle-shifters for convenient gear-shifting, and promised 5.8 l/100km fuel efficiency and 134g/km CO2 emissions. Also available are 140 PS and 125 PS versions of Ford’s multi-award-winning 1.0-litre EcoBoost petrol engine delivering 5.2 l/100 km fuel efficiency and 119 g/km CO2 emissions. Also available for the first time as a sporty, Ford Performance-inspired EcoSport ST Line model, the new Ford EcoSport delivers driver assistance technologies including SYNC 3 connectivity, Cruise Control with Adjustable Speed Limiter and Rear View Camera. A user-centric, upscale new interior offers a superior occupant experience with floating central eight-inch touchscreen, heated steering wheel and smart stowage solutions including an adjustable boot floor. “Similar to markets across Europe, in Ireland we have seen the relentless rise of the SUV over the last number of years and the compact SUV like our new stylish EcoSport is proving just as popular with buyers as the larger models,” said Ciarán McMahon, managing director of Ford Ireland.